So today my eldest baby is 30, how did that happen? Genuinely it only feels like a few years ago that I was 30 but in-fact it was 18 years ago and I am nearer 50 than 30 or even 40. To celebrate along with the hubby's 50th next week we have come to Dubai on holiday. To see lots of pics from our hols follow me on my Insta Account. (Otis and Olive are at home and their favourite honorary auntie and uncle have moved in with them). We were very young when I fell pregnant with Billy. 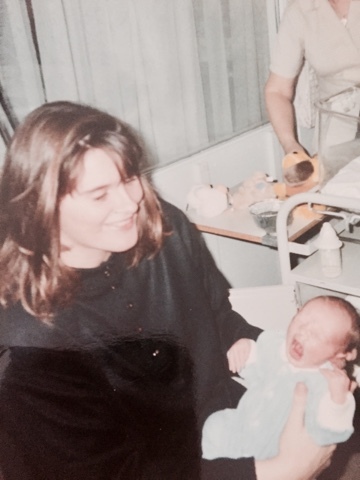 I was 17 and Richard 19 but the moment the labour staff handed me that little pink bundle I knew what all encompassing love felt like. When people tell you there's no love to compare what you feel for your child/children you can't grasp the strong immediate love that you will feel. How you would give up anything to make that little person happy and safe. But with that comes the terror that something dreadful could happen to them (for me it was worse with my 3rd. He briefly stopped breathing at 4 weeks and sent me into a crazy spiral of terror). Additionally the thought that something will happen to you and you'll not be there to see them grow terrified me also. Now I'm not pretending it's been like the Waltons in our house, to be honest it was mainly more like the Adams family. I'm not going to say I was the perfect mum, lots and lots of times I was far from it! It's hard, everyone wants to give you advice and mainly it's all conflicting. Kids (in my opinion) don't really like to conform! There was lots of please can you clear your room (and to be fair at this point you couldn't see an square inch of flooring) and the famous answer "in a minute" would come back. Sports kit's would be found in the kit bag covered in mud at 10pm the night before a game and I know I probably should have remembered to check but there were 3 of them and each of them needed a schedule to organise where they were and at what time. Be it :- football, rugby, swimming, tennis, fencing, volleyball, cricket, karate, horse riding and they are just the ones I can remember off of the top of my head! Then we had maths tutor, English tutor, drop off's to friends houses and friends at ours! So yes sometimes I'd be falling asleep watching that kit spin in the washer. 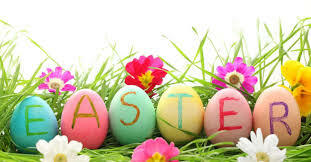 Holidays, how much do we all look forward to holidays? We put so much faith into how amazingly wonderful it's going to be. Yeah right, first of all you have to wash, iron and pack for a family (of 5 in my case) and of course every bed has to be stripped and left clean for when you get back, along with the house cleaned from top to bottom? WHY WHY WHY who cares if the beds get changed the day after your get back? The dust is only going to settle again while you're away, and lets be honest if you are worried that you could be burgled and they'll be horrified at the squalor you live in. THEY ARE A BURGLAR! (Can I just share where this came from, we got burgled once and my bed wasn't made and I was horrified). Anyway, back to the holiday. So you get ready to go normally at some ungodly hour because let's be honest those are the cheaper flights and we want to get a full day on that first day! The kids are half asleep so of course aren't easily getting dressed, you leave one to check the others come back and they're asleep on the bare duvet. Anyway finally you all get into the car, drive up the road plagued with doubts that you've left the iron on, not locked the back door, left a tap running or have you left the passports. Someones favourite toy and someone from the back pipes up I need a wee, the sad thing is it's almost a relief because you can now check all these things. The hubby isn't so agreeable and starts to curse hopefully under his breath! You get to the airport and the little darlings start to argue at the check in (they're tired you inform the horrified onlookers). Anyway you get the bags on and go through more busts ups in the queues. Then they spot the shops and you now need a small mortgage just to pay for breakfast, without them spotting WHSmiths. Anyway I'll spare you the flight details, just be reassured it wasn't pretty and just know how "much longer" and "can I have" played heavily in the journey! So you'd get to the hotel feeling slightly jaded (ok bloody exhausted) settle yourself around the pool with a book and a beverage (coffee in my case) and it begins. Oh silly you, you thought you was going to get to sit and relax for an hour, NO NO NO. They need a lolly or to be booked in to badminton, table tennis or beach volley ball. It doesn't matter it's in 4 hours time it NEEDS to be booked now! Then the room is ready and of course they all want that same bed the one with the perfect TV view. Oh yeah of course we're on holiday but you can't possibly miss The Simpsons at 6pm (Well 7pm because you're in Europe and it's an hour ahead). So dinner has to wait until that one episode they've never seen before finishes! I nearly forgot, the moans all day about suncream going on and because of this the slightly pink shoulders because after 3x5 times of chasing them round the pool you give up slightly! Dinner? Of coarse they don't want to go to that lovely looking authentic little tapas place you just passed they've spotted those pesky golden friggin arches (Mcdonalds). I think it may even be worse now. Reason being, social media makes our expectations even higher. Let's be honest nobody puts the photo's of the screaming brats fighting with each other or the views of a building site from their window or a trio of chicken mcnuggets with a side of julienne cut potatoes you only see Insta ready photo's. The other problem is kids (and adults) go into a slight panic stricken firenze if they can't connect to wifi. Nobody totally switches off any more, emails can still come and colleagues expect you to answer 24/7. All that said we had some lovely family holidays and made lots of memories. For that I am truly grateful and am hoping being the Nanny instead of the mum on this holiday I'll get all the fun stuff without the tribulations. Billy doesn't like cake so if we were home I'd be making him a tower of bread pudding. Here's my recipe, well actually it started out as my Auntie Carols recipe until I jiggled about with it. You will also need a greased 20 x 25cm oven-proof dish or tin. Break the bread into chunks and tip into a large mixing bowl. Pour over the milk, mix well and leave to soak for 30 minutes. Add the remaining ingredients and mix well to thoroughly combine. Spoon the mixture into the prepared dish in an even layer and bake on the middle shelf of the preheated oven for about 45-50 minutes or until golden brown and set. 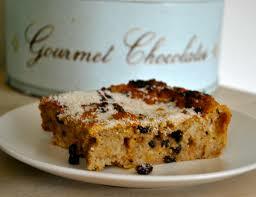 Leave the bread pudding to cool before sprinkling with caster sugar and cutting into thick slices to serve.